Promotes clear vision: Lutein, also known as the “eye protective nutrient”, is a carotenoid (antioxidant) found in dark green leafy vegetables like spinach, kale and broccoli. This nutrient has been found helpful in the treatment and prevention of cataracts and age-related macular degeneration (AMD), the leading cause of blindness in older adults. As some find it challenging to obtain sufficient lutein through diet, supplements can be beneficial – but not all are created equal. Insist on FloraGLO® Lutein, recognized by nutritional supplement companies worldwide as a quality product that will maintain its stability and potency. Extracted from marigold flower petals, FloraGLO® Lutein has a unique and innovative purification process that has earned it patent protection in the United States, Canada and other countries. It is used in more clinical trials than any other lutein. 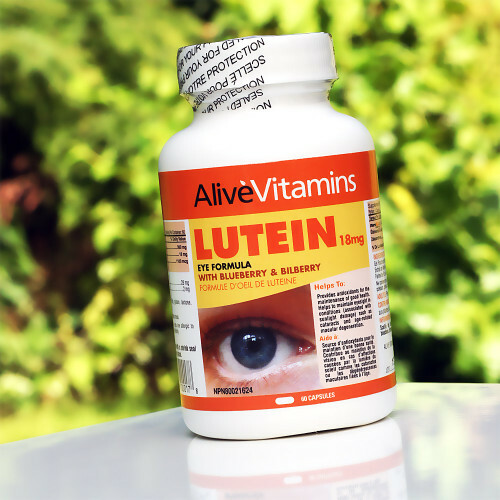 The Alive Lutein Eye Formula also contains blueberry and bilberry, both of which contain antioxidant compounds. In addition, bilberry improves blood flow to the retina. Lutein promotes clear vision in several ways. It absorbs the sun’s harmful ultraviolet rays and also blue light. In addition, lutein neutralizes free radicals in the retina which is the light sensitive part of the eye. In the centre of the retina, directly behind the lens, is the macula. The cells in this area help produce the clarity of vision needed to read and see objects. A key measurement of eye health is the density of macular pigment because macular pigment protects the retina. Lutein and its co-existing molecule zeaxanthin (found in FloraGLO® Lutein) are the main antioxidant pigments and the only carotenoids found in the macula and lens. Fights Premature Skin Aging: Lutein fights against free radicals and is also believed to absorb blue light as it penetrates skin layers. In studies, lutein has been shown to increase skin hydration and elasticity and to decrease skin lipid peroxidation. Lipids are oily components in the skin that provide a barrier inhibiting loss of moisture from the skin. Contains NO: Citrus, corn, dairy, eggs, fish, gluten, lactose, shellfish, soy, wheat, yeast or pork. Adult Dosage: Take 1 capsule once per day after a meal.